monitoring station data site data users need to perform in-depth evaluation of specific chemical of interest. Landfill Superfund site operators are spending millions of dollars in site characterization and cleanup of the contaminated groundwater. Current and old landfill sites have to follow stringent compliance requirements to protect public health and groundwater. Recently valuable regional information is becoming available free or at low cost. EWM procedures efficiently use multimedia data. Likely slow leakance rates from landfill sites need a detailed local-scale conceptual model and identification of groundwater flow paths and travel times which are not used commonly. This results in duplicate and redundant data collection efforts. EWM monitoring strategy is based on detailed conceptual site models, quantitative uncertainties, and calibrated regional and local-scale models. EWM design includes data storage and real-time assessment of latest data. 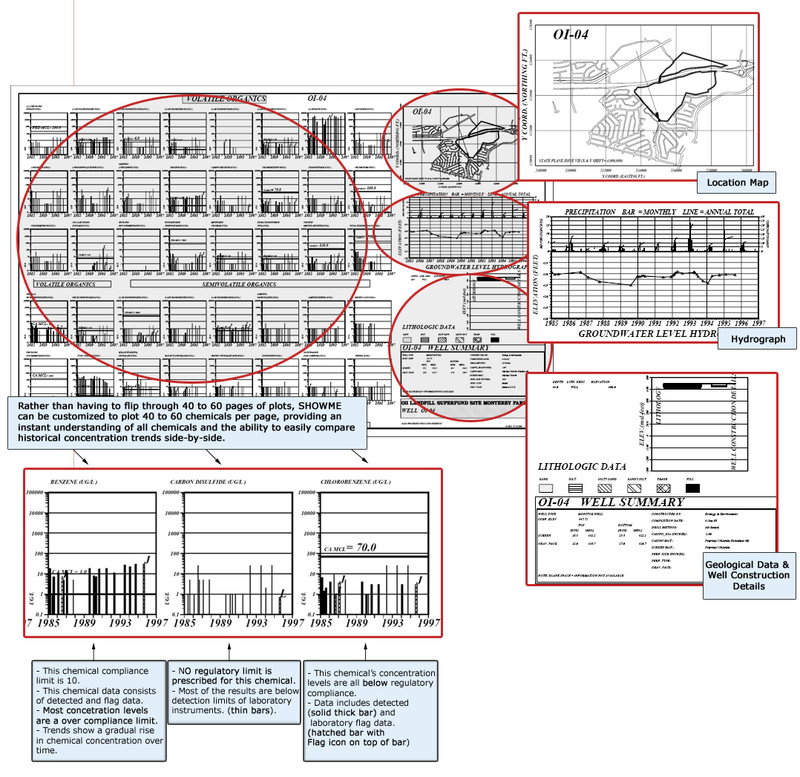 Data used in the landfill initial EA and design generally gets buried in the project report. EWM procedures provide efficient means for object-oriented data storage, editing, and updates. Currently laboratory results are entered and maintained in tabular form. Site operators and regulators generally depend on the extracted partial data processed by a contractor or staff. 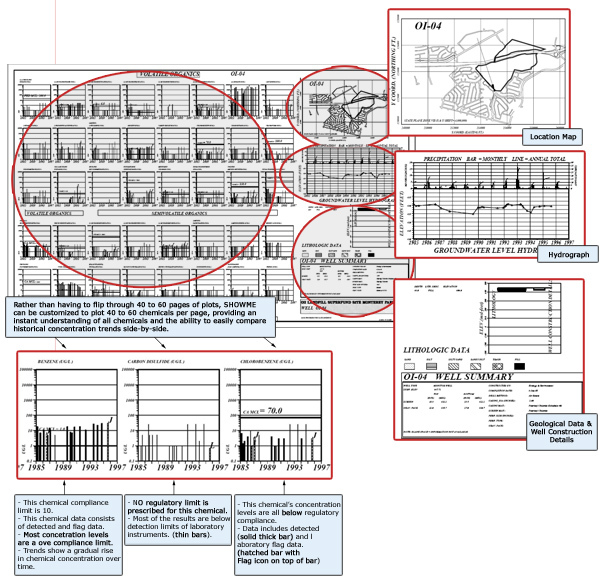 EWM – SHOWME interfaces with the site database and provides nightly updated plots of multimedia data. EWM Group’s concise informative displays include all details for site managers and regulators. Not maintained as a normal practice. EWM provides most current travel path and travel time estimates with flow vectors. These are not generally maintained in the project files. EWM understands scientific, engineering, and regulatory needs. EWM also understands monitoring, data processing, and analyses costs. Regulatory non-compliance penalties are high. Rather than piecemeal last minute costly repeated efforts, EWM proposes the development and maintenance of a systematic plan of each site which will keep site operators, regulators, and the concerned public fully informed of the current environmental status through the internet. 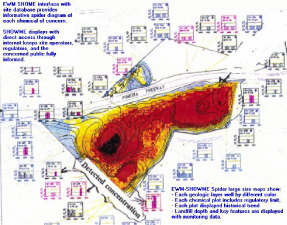 Illustrative EWM-SHOWME samples of a 170 acre landfill site. Regulators and site operators used to spend hours to understand site characterization data collected at a cost of approximately $30 million dollars. 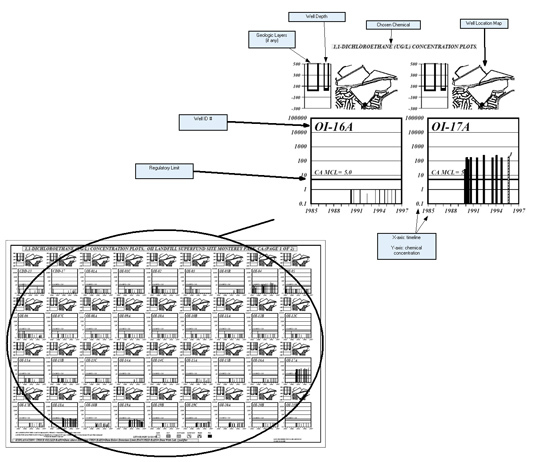 EWM-SHOWME automatically generated displays of monitoring stations, chemical plots, spider diagrams, piper diagrams, cross-sections, and others assist in providing an efficient means for quick informed decisions that are acceptable to all participants. Reports containing SHOWME displays were mainly kept handy for routine project decisions, rather than boxes full of tabular outputs.